I like the perceived better RNG along with the double drop, finally made it worth it. I collected 65 shards today to 5* one that I only unlocked earlier this week. The advanced tactics flash event rewards made it worth it. After the bad experience with the Ewok event yesterday, those rewards kind of made it up. Now give me that event weekly please. I think I like the reworks but since I only used Daka up til now, I don’t have much to judge on. I hope I don’t see a bunch of them in GW tomorrow all geared and leveled up. Interesting flash event. Needed to rely on Rng to beat it. Poor choice facing CLS. We do it 5 times a day in arena. Maybe a more appropriate team for the setting or encounter. 27 months to be able to fully promote Mother Talzin and Wicket is absolutely ridiculous. What a joke. Love the plethora of events here - really feels immersive in to this rework and release. Rewards given out are also satisfying. I'm sure it's been touched on many times before but I'd like to throw in my lot about the timed "Flash" events. I don't see why these events can't be 24 hours long, or at least run for the duration of a 24 hour period. The most recent Nightsister events occurred while I was sleeping for my nightshift job, as did the ones for Phoenix and Luke. I only get to do them if I'm up later than I should be and I can't see myself setting phone alarms to wake up from a dead sleep for these events. Having them on limited time durations: Helps and entertains no one. Having them on 24 hour durations: At the very least helps me! Nightsister events were very well done! And the rewards were awesome! Well done, guys and gals. Positive impression after that event. Glad that the both advanced tactics and defence of dathomir doesn't require insane team with T11 gear and top mods. Completed 2/2, 1/2 with Omega Daka eader in G10, and Assaj G9, the rest sisters were much lower level, gear and mods. Dathomir's new buff is quite usefull and stylish. Feedback? It looks like it's going to take a long time to get my 7* Talzin. I had no problem getting the 10 buck pack, and I refreshed for her shards twice which was a good deal. But I'm still going to need to get enough crystals to buy 3 more of the absurd packs just to 5* her. Too slow from what I'm seeing to ever get her to 7* - the events were cool and a lot of us are willing to spend a some - but setting it up that you need to whale out to get her to 7* in anything resembling a decent time frame is ridiculous. As usual, CG manages to do something really cool, make it exciting, and then immediately ruin it. I don't know how you manage it each and every time, but congrats. You're spot on once again. I don't like the pay walls for Talzin. Events are better overall but relax on the paywalls and keep upping the rewards. 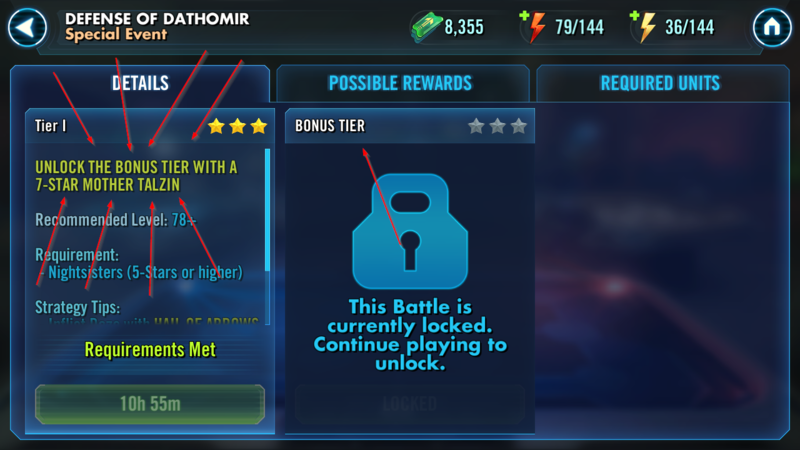 Aside from CLS, I can't remember the last good toon not locked behind a paywall in order to achieve 7 stars. It discourages me from attempting refreshes or buying packs when I see videos of 5 shard drops several times in a row. It feels far too much like gambling. The house always wins. Insanely long Mother Talzin farm + huge amount of zeta mats each event = ridiculous whaling advantage again. You can now officially just buy your zeta mats. I don't think I've seen a worse event structure in this game ever, and there have been some really bad ones. This. On top of the fact I was just excited in general to go full nightsisters. That excitement does not equal me putting the hundreds into the game it would take to do so. I'm not asking for a new toon for free. I paid some, would pay some more. But no way am I whaling for anything on a mobile game, no matter how much I was looking forward to it. Which means it just goes into the slow farm. I guess she'll be sitting at 5* for a long long time. I'll check back next August when I finally have her 7*. I've said it all over the forums, overall, superb events. and then great job putting carbs and guns in the hard tier, as that's obviously what we need and have been begging for, but to only get 5 of each, once every 3 days, doesn't really do much. Any chance we could up that amount? Or have 3 or 4 free refreshes over the course of the 8 hours? I enjoyed the events but am disappointed by how difficult/long it's gonna take to farm Talzin without spending the GDP of a developing country... She's a great character from what I can see, but I'll probably never know firsthand since I can't farm her. Why are your opponents abilities "nerfed"? Rex doesn't grant tenacity up, Luke doesn't regain protection on his special and Old Ben never taunts. I realize that the idea of the event is to "show off" Nightsisters, but even my current mediocre NS team (without any of the new characters) can mow through what looks like a meta-team...but clearly is not. This seems odd at best, a little misleading/disingenuous at worst. Almost like you're trying to make the Nighsisters look better than they are against the current meta. What is the sense for only working towards that according achievevement by completing Tier 1 of that event? You basically have to decide between completing that achievement and getting more shards for Ghost/Zombie. Makes not much sense to me. @CG_CapGaSP I think you forgot there is both a special crit chance and a physical crit chance when you tried to make the alter immune to crits. I did not. You can't critically hit a piece of stone, but if you're using magic you can critically hit the spirit inside it! 1. krennic or Thrawn blaster magic but wedge or Biggs not. 2. Asajj light saber when used in an AoE attack magic but when used in single target not. There are many other examples but special damage is not dealt with just "magic" attacks. Sadly it is partial answers like these that make no sense from CG that make me wonder if the character dev talks to the event dev.